The myth of the "tipping point" and the fragility of cycling. "Birmingham is working towards the ‘tipping point’, a common pattern within cities, where a modest rise in cycling levels suddenly gathers pace. We want to accelerate the pace of growth further, creating a visible ‘step-change’ in levels of cycling within our city being part of everyday life and mass participation a reality. Our aim is to achieve a cycling modal share of all journeys of at least 5% by 2023, which research undertaken by the European Platform on Mobility Management (EPOMM) has shown is sufficient to generate the critical mass required to make it an attractive mode of travel. By 2033 we want this to rise to levels of comparable European cities such as Munich and Copenhagen at over 10%." As is so often the case, they're aiming far too low. A target of just 5% of trips at a point in time ten years in the future ? Attempting to achieve such a slow rate of improvement makes it difficult to measure whether there has been any success at all year on year. It's also a good way of ending up making no progress at all. Nevertheless, this is described as a "step-change". It is also odd that their aim over 20 years is to emulate countries which have achieved less than the Netherlands, and also that they define "comparable" with Munich and Copenhagen as a cycling rate of 10% of journeys when both those cities are currently at roughly double that level. But the biggest error is the reliance on a "tipping point". Where is the evidence for the existence of this "tipping point" ? Actually, history shows us that without continuous substantial investment to support it, cycling declines even from a very high modal share. In the Netherlands, 27% of journeys are currently made by bicycle. Because it is mostly shorter journeys that are cycled, that translates to bicycles being used for around 10% of the total distance travelled. In the late 1940s and early 1950s, British people used bicycles for around a third of the total distance that they travelled. This declined steadily and it took until 1962 before the UK dropped to the present day Dutch level with about 10% of distance travelled being by bicycle. Since then, the UK has declined and stagnated. 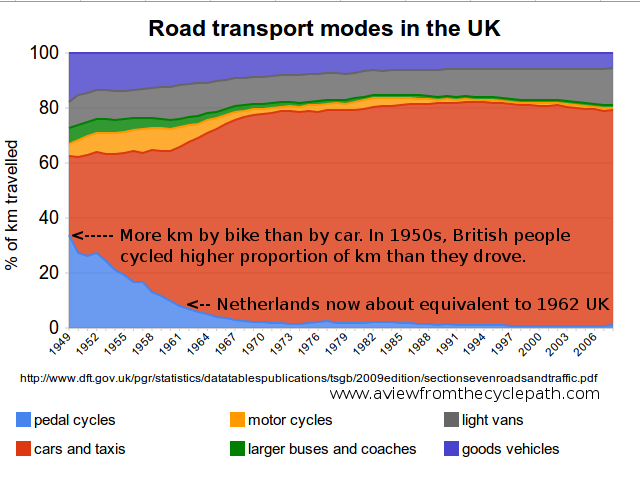 What happened in the UK to make people switch away from bicycles was a huge programme of investment in infrastructure for motor vehicles while bicycles were mostly not catered for at all. Cycling became less safe compared with other modes of transport as well as subjectively unsafe due to the proximity of an overwhelming number of motor vehicles. Cycling became less desirable as a mode of transport and has become marginalized. New Towns in the UK provide an example in miniature. Stevenage, for instance, had a higher cycling modal share in the past than it does now. When it was first built, there was (for the UK) a relatively good grid of cycle facilities and these led to most locations. Decades of under-investment, lack of maintenance and not bothering to integrate cycling into newer parts of the town have resulted in cycling having no advantage in Stevenage and that town now having roughly an average cycling modal share for the UK. Denmark provides another example. In the 1980s, Denmark had a cycling modal share which was slightly behind, but similar to that of the Netherlands. Both countries were investing similarly and growing cycling at a similar rate. It was believed that the Danish culture would result in them always cycling. In fact, cycling comes through investment in making cycling into the most attractive option. 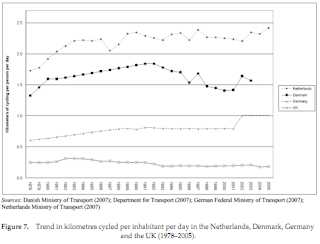 Unfortunately, because investment in and prioritization in planning for cycling were not maintained at an adequate rate and the result has been a steady twenty year decline in cycling in Denmark. Davis in California, which calls itself the "Most bicycle friendly town in the world", is a small city with a size population to Assen (though it's much more densely populated than Assen). The top cycling city in the USA, Davis hosts a large university for its size as well as other educational facilities. A high student population always make it easier to achieve a high rate of cycling and Davis has a high student population even compared with other university cities. While one quarter of Groningen's population are students, and the population of Cambridge in the UK consists of one third students, more than a third of Davis' population are students and a large proportion of the rest of the population are associated with education. Davis once described itself as "home to 15000 bicycles", but that was when the population of the city was smaller and even more focused around the university. Some people estimate that as many as a quarter of all trips were by bike in Davis in the 1950s but there has since been a well documented decline in cycling to the point where the cycling modal share is somewhere between 1/4 and 1/3 of what it was, with even students cycling less than they once did. You may wonder how this could have happened. An interesting reply to the last link about Davis points out that they have experienced demographic change which works against cycling (fewer students as a percentage of the total) and many other changes including the retirement of a key city figure with the result that "the city lacks any upper level administrators who are anywhere near as dedicated" to cycling. Davis is now trying to boost cycling by restricting student car ownership in a similar way to Cambridge - something which cannot be applied generally to all cities, and which won't help much when recent growth to the city's population has largely been due to non-students. More recently, there's the much documented fall of cycling in China. The term "critical mass" was coined by the film-maker Ted White after he saw Chinese cyclists form into a mass at the side of the road and force themselves across the traffic. This is something which required an enormous number of people on bicycles to achieve. Bicycles were enormous in China, but there has been an enormous decline and that country is now famous for its massive traffic jams. trend while the UK did not. Finally, the Netherlands also provides a good example of decline from a high base. Just like the UK, the Netherlands also saw declining cycling from the 1950s until the mid 1970s as roads were redesigned to accommodate more and more motor vehicles at the expense of cyclists. The UK and the Netherlands followed a very similar decline from the 1950s through to the 1970s (though the decline in the UK reached a deeper point). Though the Netherlands now has the highest cycling modal share in the world, this country has actually still not grown all the back out of that enormous decline. Growing cycling is a slow process, even here. It required an enormous amount of work over many years to achieve a relatively small rise from the dip of the 1970s. The trend to higher cycling levels only came after a second revolution took place on the streets of the Netherlands. Despite a high level of investment, further progress has been slow for the last 20 years. Just as growth is a slow progress, decline also takes time. The slow rate at which declines occur can hide serious issues of under-investment and bad planning for many years, especially if other factors (e.g. growth due to demographics (students / older people) hides the decline. The Netherlands needs to learn from its own past and take the warning from Denmark (see above) seriously. Cycling is no more "in the blood" of the Dutch than it is of the Danes and cycling will just as easily go into decline here if cycling conditions are made steadily worse. In some places this has already happened due to such things as shared space scaring people off their bikes and other similar mistakes. 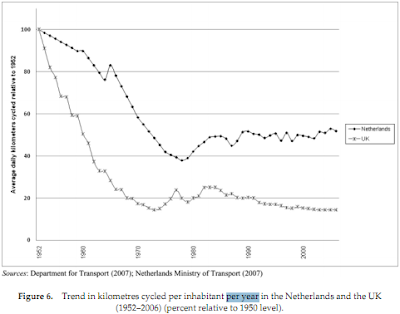 If subjective safety is no longer taken seriously enough in the Netherlands then people will stop cycling, the decline which began in the 1950s will continue, and the period between 1970 and 2010 will appear as a difficult to explain plateau on a future version of the graph above. Assen in the 1970s. Many streets in other countries still look this. 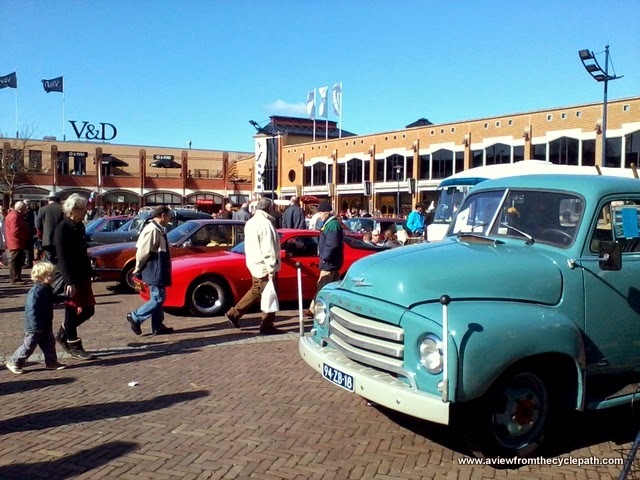 If Assen still looked like this then there would not be so many people cycling as there are now. Watch a video of how this street looks now. The traffic lights were removed long ago, but the through traffic went first. Unfortunately, such lessons have been forgotten, leading to new examples poorly designed infrastructure. So what happened to the "tipping point" ? From the above examples we can see quite easily that merely having a high cycling modal share is not enough to ensure that cycling continues to grow. Many examples exist of places which have or had a much higher cycling modal share than Birmingham's target of 5% of journeys by bike, but which which have since gone into decline and continued to decline for long periods of time. All that is required to cause cycling to drop is for conditions conducive to cycling to disappear. When cycling becomes less safe, less pleasant, less convenient than it used to be, people will switch to other modes of transport. now considered to be too steep. cycling modal share could drop. How can we stop this from happening ? Constant new investment and ever improving conditions for cycling. Cycling must be safe, attractive, pleasant and efficient as a means of transport to all locations. Conditions must be such that everyone wants to cycle, not just a small section of the population, because if cycling is only for a brave few then the modal share can only mirror the small segment of the population who cycles. Because there is no low level of cycling which will grow automatically, asking for little and expecting to achieve much makes no sense at all. Real world results are proportional to countries' expenditures. The Netherlands spends €30 per person per year on cycling infrastructure even after 40 years of effort in building the required comprehensive network of routes because there is no choice but to do this, because the alternative is to watch cycling decline. However it's important to note that this higher level of expenditure than any other nation doesn't really cost anything. While badly designed and constructed cycling infrastructure costs money and gives few benefits, the benefits due to good cycling infrastructure are greater than the cost. Remember that even the Netherlands has not yet grown back out of the decline between the 1950s and the 1970s. Denmark's troubles with cycling should be seen as a particularly strong warning to this country. If the Netherlands copies from Denmark then it could very easily suffer the same decline as has Denmark. But while the Netherlands has no choice but to go it alone and continue to try to maintain the lead, other nations do have a very clear example to follow. The Netherlands is the most successful nation in cycling and it is therefore where the best solutions are likely to come from. However, mistakes have been made even here and it sis important to take inspiration from the very best examples. On this blog we try to help by providing examples of what works and examples of what not to do. We also run regular study tours on which these concepts are demonstrated. Locations with universities generally have more cycling than other similar locations. Areas which become the new trendy place for young single people to live (i.e. where a process of "gentrification" or an influx of "hipsters" has been seen) will often see an upturn in cycling. Neither of these things is due to the infrastructure, they are due to the average member of the population being easier to attract to cycling because these demographics are less likely to be put off by those things which would put off other people from cycling. Demographic factors are always important. Not only infrastructure but also the people that are served by it as well as other factors such as the geography make a difference to the potential of any given location. The best infrastructure allows any location to fulfill its full potential, whatever that potential might be. Groningen currently has three times as much cycling as Cambridge. However if Cambridge had the infrastructure of Groningen then it might well achieve a higher cycling modal share due to the helpful combination of more favourable demographics, local by-laws banning student cars and milder weather. At present, Groningen is making far better use of its potential for cycling given other factors, while Cambridge is not. I've been writing about the decline in cycling in Denmark for six years and after years of denial, it seems that at last some people in Denmark have started to talk about it as well. This is very good news for Denmark. It is only by recognizing a problem that it can be fixed. Publicity alone does not grow cycling. Pretty pictures don't do it, and nor does international marketing. It takes infrastructural change to encourage people onto bikes. Journeys by bike need to be made safe and convenient. 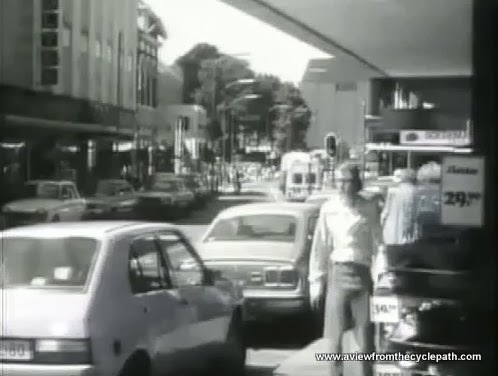 Read a new blog post about how when it was already in decline in New Zealand, planners ignored cycling and allowed it to wither. This post was started some months ago but I finished it today after reading an excellent post on aseasyasridingabike which makes a very similar point about the idea of a "critical mass". Also interesting this week is ibikelondon's piece about the decline of cycling in China. Also read a Crap Cycling and Walking in Waltham Forest blog post from 2011 on a similar subject. I've been a member of an out-group for one reason or another for almost all my life. I've lived as an immigrant in more than one country, by following a diet which some people felt they had a right to criticize and most of all by cycling as everyday transport as this is something people can see and form an opinion on without even having to talk to the person involved. Yes, even white men can be subject to prejudice. I don't like it and I speak up when I see it. Imagine if there were a form of transport which was smaller than a car, used considerably less fuel than a car so produced less CO2 when in use, which took less space to park so could be parked more densely than cars thus saving space in crowded cities and as a result could usually be parked free of charge. Imagine if this means of transport also cost less than a car and required less training to use thereby potentially making it more accessible to a larger part of the population. Imagine also if the users of this means of transport were small in number and as a result they were discriminated against. Imagine if many people held everyone who used the form of transport just described to be collectively responsible for the bad behaviour (perceived or real) of some users of that mode of transport. Readers from other countries will likely identify with the last paragraph because it describes cycling in their country. Cyclists are often subject to anecdotes about behaviour of cyclists as a group, and whether or not these stories are true they are held collectively responsible for what has supposedly occurred. Letters pages in newspapers and online forums often include claims about "cyclists" breaking the law and exposing others to danger. They supposedly ignore red lights, ride on pavements (sidewalks) and many people claim they have been "nearly killed" by cyclists. Cyclists are alternately thought either to be an elite or to be unemployed. Either way, they are considered to be a group which is apart from normal society. Commentators in newspapers join in, the police join in, politicians join in. It becomes the availability heuristic. This is a very difficult thing to stop because facts become hidden in noise, though some people do try. But this blog post is not about cyclists and it's not about bicycles. All of the above generalisations are applied to mopeds and the people who ride them in the Netherlands. Moped riders are a minority in this country who make up about the same proportion of the population and about the same proportion of trips on the roads and cycle-paths as do cyclists in other countries. Moped riders are frequently the object of a very similar form of out-group discrimination to that which we see elsewhere directed at cyclists. Very similar language is used by Dutch commentators when discussing mopeds, including that of "collective responsibility". In the Netherlands there are two classes of mopeds. One class has yellow number plates, is limited to 45 km/h and riders must wear a helmet. These are banned from urban cycle-paths but may use rural cycle-paths. The other class of mopeds have blue number plates. These are limited mechanically to 30 km/h and must not be ridden above 25 km/h. That's the same speed as electrically assisted bicycles. Just as with other modes of transport which travel at a similar speed they don't require a helmet and may be ridden on cycle-paths. Currently there's a campaign against the "moped menace" promoted by the Fietsersbond. They want to "give the cycle-path back to the cyclists". The organisation has set itself up as judge and jury and is using the same kind of scaremongering language against moped riders as is used against cyclists in other nations where cyclists are a minority. Mopeds are claimed to be "too fast", "wide", "polluting", "dangerous" and "ridden irresponsibly". It is currently claimed that 96% of mopeds exceed the speed limit, and that their "average" speed is 34 km/h. 34 km/h is a somewhat implausible average speed to maintain on an across town journey using any form of transport so I suspect this alarming figure actually refers to something along the lines of a peak speed measured for the along a long straight. Note that when the Dutch police prosecute a motorist for speeding they actually take an average over a relatively long distance and then subtract a few km/h before calculating the fine. The same standards are not being extended to riders of mopeds by those who criticise them. An online video uses dramatic music and many edits to give an impression of danger, but the riders caught on the video mostly ride quite carefully and are moving at obviously lower speeds than claimed to be the average. There is no speed limit for the machines which rely only on human power and 25 km/h is easy for any reasonably fit person to exceed on any type of bicycle. One group representing moped riders has instead called for a strict 25 km/h limit for all vehicles which use cycle-paths. Who rides a moped ? "Bontkraagjes" - a term which literally means a fur hood on a coat, but which is used to refer to supposedly criminal immigrant youth. Much the same connotations as "chav" in English. Girls from Ondiep and Zuilen (two districts of Utrecht with less good reputations), friends, possibly something more, daughters of a sun-bed orange mother with bleached hair, chain-smoking and supporters of FC Utrecht"
The online video attracted one comment almost immediately from someone who refers to riders of mopeds as "bastards" ("rotzakken" in Dutch). they part of the out-group ? People don't generally consider mopeds to be a form of transport for other people like themselves. In reality, of course, the people who ride mopeds are simply a cross section of society. This is the case for other forms of transport too. Where its a common form of transport, the question becomes meaningless. For example, a question about "what type of person drives a car" would be meaningless. In the Netherlands it would also be meaningless to ask "what type of person rides a bike", but in other countries cyclists are considered in the same way as moped riders are here. i.e. "lycra louts" and worse. None of this looks remotely like the basis for rational debate on the pros and cons of a means of transport. That's a problem when mopeds are discussed because it seems that for some people they are not just a means of transport. Responses to questions about mopeds are not necessarily rational. The moped "menace" or "scooteroverlast" story has been bubbling along both online and in print for some time and many bloggers have joined in to cheer this future change. I'm not amongst them because this looks all too much like the type of prejudice which I faced as a cyclist when I lived in the UK. Many of you may already have read about Amsterdam's plans to ban the slower class of mopeds from cycle-paths and make their riders wear helmets. Organisations which represent moped riders believe this populist move will increase danger for the minority affected and refer to it as an example of "life threatening gesture politics". Unfortunately, while it's clear that many people dislike mopeds (and their riders), the reasons why moped riders should be banished from the cycle-path are still not entirely clear. Below you'll read about several of the objections commonly heard to the slow class of mopeds. Not one of these is a clear cut example of a problem caused by mopeds but not by a different type of bicycle for which there are currently no objections. Perhaps the most popular reason given for banning low power mopeds is their speed. The 25 km/h speed which they are limited to isn't really very fast but even that speed can be too high to be safe in some locations such as crowded inner-city cycle-paths or streets. It's true that many mopeds go faster than 25 km/h in some circumstances, it's also true that many of them do not. Just as it is not fair to paint all cyclists with the same brush and to apply "collective responsibility", so it is not fair or justified accuse all moped riders of bad behaviour based on being a member of a group. Some mopeds are ridden aggressively but this also is not a problem due to mopeds. Some cars and some bicycles are also used aggressively. Sending responsible people onto the carriageway with a slow vehicle, with nothing more than a token helmet for protection, is not an answer. It is a genuine problem that people modify mopeds to remove the speed limiting devices. This is easy to do because the same mopeds are sold as faster models in other markets and the speed limiting devices are a non-essential add-on part which is easy to remove. It should be no surprise to anyone that teenage boys who own mopeds quite often perform this modification. By doing this they break existing laws and their mopeds can be confiscated. is required for these speeds. If speed is the problem then other classes of cycle-path users should be treated equally on the basis of speed. But that's not what is being proposed. There has also been recent growth in sales of "speed pedelecs" in the Netherlands. Speed pedelecs are licensed in the same way as the slow type of moped. While by law they are limited to 25 km/h just as are mopeds and normal e-bikes, no-one would buy one to ride at that speed because it costs money for the number plate and registration. Every one of these bikes can exceed 25 km/h by design as they are intended for riding at 45 km/h in Germany. If mopeds are bad on the grounds of their speed then speed pedelecs which can travel at nearly twice the speed are surely worse. Many e-bikes provide assistance at (slightly) more than 25 km/h even as they are delivered. Should they also be banned ? Even when this is not true, modifying them to remove their 25 km/h limit is in many cases just as easy as modifying a moped to do the same. Many e-bikes can then continue to provide assistance well above 30 km/h, sometimes above 40 km/h. Should e-bikes be banned on the grounds that they can be easily modified to break the law ? The mere fact of being able to travel at speed (with or without power or modification) isn't enough. If we were to treat all riders of all machines capable of 25 km/h and more in the same way as we are treating the riders of mopeds then the list of machines permitted on urban cycle-paths would become very much shorter. Even riders of standard bicycles (I usually ride my town bike at more than 25 km/h) would have to ride on the road and wear a helmet, let alone racers, recumbents etc. Who would then be left on the cycle-path ? While The Netherlands is much like any other country with regard to annual inspections for cars and trucks, this country has no required annual inspection for any powered two wheeler. Even powerful motorbikes which can be ridden legally on the motorway at 130 km/h may not have had their brakes, tyres and steering inspected for years, let alone their emissions and noise levels. Coming from the UK where motorbikes have to pass annual inspections which if anything are more stringent than those for cars in order to ensure their roadworthiness, this came as a surprise to me. car exhausts used to smell like. Many mopeds, especially older models, have two-stroke engines and it has been known for a long time that these engines often produce more carbon monoxide, nitrogen oxides and particulates than 4-stroke engines. Small not very well maintained 2-strokes can be prolific producers of these emissions. In the past this was considered to be a small problem but these days a large percentage of total emissions comes from 2-stroke engines. The rise in the significance of emissions from small engines came about not because two-stroke engines have become worse but because car exhausts have become remarkably less toxic. Overall, we have much cleaner air in towns now than we would if cars had remained the same as they were in the 1970s. Though progress has been made, there's no reason to stand still on this. Cleaner air and less noise pollution too in our cities and towns are certainly worth pursuing. Purely on the grounds of their emissions, there is a good case for banning all new two-stroke engines whatever purpose they have (i.e. not only mopeds but also lawnmowers, outboard engines on boats, leaf blowers etc.). A 2006 paper from Nigeria suggests that that country was already taking this seriously eight years ago so perhaps the Netherlands could do this too. Actually, it has been discussed here in the past, but sadly there has been no action. I hope that upcoming European regulations will force lower emissions of both two-stroke and four-stroke engines. But why does this country still have no annual inspection for powered two wheelers ? The introduction of annual inspections could go a long way towards ensuring not only that brakes and tyres were of good quality and that mopeds and motorbikes were safe for their riders but also that speed limiting devices were installed and working, that the silencer in the exhaust pipe functioned correctly and that the engine was tuned to minimize emissions. Moving mopeds from the cycle-path to the road and forcing their riders to wear a helmet does not in any way address the pollution issue. Electric mopeds are the fastest growing group. They don't produce any local emissions or much sound at all, but while fumes and noise are being used as a reason to ban moped from cycle-paths, those calling for them to be banned are also calling for electric mopeds also to be banished to the roads. This shows even more clearly that raising noise and fumes as an issue is spurious. Huge rise in numbers ? Populist newspapers have occasionally carried headlines about how sales of low speed mopeds were growing and people seem to have become rather caught up by these headlines. It's all too easy to get people excited about numbers which sound large when they're presented without anything to compare them with, so lets compare the figures for mopeds with other means of transport. According to BOVAG (an umbrella group representing car, motorbike and bicycle companies), sales have actually dropped year on year for several years. Total moped sales (fast and slow) reached nearly 100000 per year at their peak between 2008 and 2010, but have now dropped to under 60000. In 2013, just over 45000 low power mopeds were sold in the Netherlands, 12.5% fewer in comparison with 2012 and nearly 30% fewer than in 2010.
few seem to be concerned about. Against these sales figures, it is claimed that the number of low power mopeds in use in Amsterdam has tripled in the last six years and that this is one of the reasons why action must be taken. Figures for the first four months of this year (not as reliable as whole year figures) show that sales may have grown back to the 2012 level but that still leaves them a long way short of 2008-2010. In the last few years, the sales of electric low power mopeds have grown steadily relative to internal combustion engine models. This year so far they represent about 8% of sales. There are now more than 20000 electric mopeds in use in the Netherlands. Many moped sales in recent years have been to people aged 30+ who bought them as a cheaper to use and easier to park alternative to a car. Not only have moped sales dropped, but in the last few years, car sales have also dropped by 10% per year, bringing last years total sales figure down to 417000. This is a considerable drop since 2011 when over 555000 were sold. In addition, 100000 used cars were imported last year. Bicycles are currently selling at a rate above one million per year. Almost one fifth of those sales are of e-bikes. These e-bikes have the same 25 km/h speed limit as do low power mopeds and they outnumber mopeds by a ratio of four to one. For all the alarm about a rise in moped numbers, 22 bicycles and nine cars are sold for each moped. Eighteen million bicycles in the Netherlands are used for 27% of all journeys. Usage figures for mopeds are not easy to find but if we assume that the 600000 mopeds currently registered are used in a similar way to bicycles then mopeds make up about 1% of total traffic in the Netherlands - a figure which is compatible with moped riders being considered as an out-group as their share of traffic is comparable with bicycle usage in many other countries. There are surprisingly common objections to mopeds on the basis that they are "wide". This is bizarre because it doesn't hold up at all relative to other cycle-path users. Like any type of two-wheeler, the widest part of a moped is the handlebars. Just like bicycles, the handlebars of mopeds have a width which is determined by the width of the shoulders of an average person. In comparison with many cargo bikes, especially three wheeled bakfietsen and also many velomobiles, mopeds are not wide. They're certainly narrower than many of the vehicles used by people with disabilities such as the four wheeled mini-cars and bikes which accommodate two riders sitting next to each other. If certain categories of existing cycle-path users are to be banned from cycle-paths on the basis of their width then we should treat all equally. If both width and potential speed together are the issue then electrically assisted bakfietsen, recumbent tricycles, velomobiles and mini-cars should also be considered. Where are the accident statistics ? This is a serious question because while many people make claims about how dangerous they think mopeds are, no-one seems to be able to find any actual figures to prove it. Mopeds are simply not anything like as dangerous as people expect them to be. I noted before that back in 2007, when sales of mopeds were higher than they are now, one commentator pointed out that in comparison to other causes of deaths on the cycle-paths and roads of Amsterdam, "scooter deaths (amazingly!) were a rounding error". adequate for moped riders either. a safe environment for moped riders. Moped riders themselves are over-represented in accident statistics, but these largely show how vulnerable the riders are. Moped riders are far less numerous than cyclists yet they represent nearly so large a share of the deaths on the street. They share their vulnerability with cyclists, as like us they come off worse in crashes which involve larger and heavier vehicles. There is a real problem of mopeds being dangerous for their riders, but real figures showing that mopeds are significantly dangerous for people other than their riders simply don't seem to exist. I've been asking people to provide figures to back up their assertion that mopeds are a significant danger to people other than their riders for many years, but no-one has ever been able to do so. One assertion leads to another but assertions are not evidence. If you know of any actual evidence please post it in the comments below this post. A recent "Educated Guess" document from SWOV is the closest that we have to up-to-date accident statistics. On page 20 you can find the numbers of people killed, injured and who required nothing more than first aid as a result of a moped crash in Amsterdam. The number of deaths alternates between zero and one. The number of injuries requiring hospitalization has grown from 16 per year to 71. SWOV claim that moving mopeds to the roads will reduce the number of injuries requiring hospitalization by five per year. They also estimate that helmet compulsion will reduce this by another 12 per year. However, their main claim for improved safety relies on convincing people not to ride mopeds. "Modal shift" is supposed to reduce the number of moped injuries by another 32 per year. This seems spurious. Their headline figure of 261 fewer injuries is more dramatic because they include an estimate of how many fewer first aid cases are likely, but note that more than half of this estimate is again supposed to result from riders giving up rather than moped riding actually becoming safer. At no point does SWOV attempt to present figures which demonstrate danger to other modes of transport due to mopeds. Note that in any other context, cycling campaigners would be against compulsory helmets. SWOV have been criticised by cycling campaigners for their stance on bicycle helmets in the past. Now that they've been co-opted into a campaign against mopeds, it seems that this is okay. by racing cyclists at a similar speed. Subjective safety is very important for cycling. If cycling feels unsafe then people won't cycle. Subjective safety is improved by building an environment where it feels safe to cycle. Quite apart from separating high speed traffic from low speed traffic, a high degree of subjective safety also requires changing the infrastructure so as to reduce the frequency of conflicts on the cycle-path. However, concern over subjective safety should not be used to mask a desire to ban a minority group based on prejudice. If people are scared to walk down the street at night because of youths wearing hoodies, the solution is not to ban youths or hoodies. The Netherlands used to understand this well and social policy here successfully reduced the rate of crime (such that prisons have had to be closed due to a lack of prisoners to put in them) as well as peoples' fear of crime. There is a claim that mopeds are driving older people away from cycling. Like other anti-moped claims, this doesn't really stand up to much scrutiny. In fact, older people cycle three times as much now as they did thirty years ago. One of the reasons why long distance cycling on rural Dutch cycle-paths is so efficient is that until now they have had to be designed to accommodate the faster 45 km/h mopeds. gets blamed for crashes ? That appears to be changing. There already exist new rural cycle-paths, even "fietssnelwegen" (cycling superhighways) on which mopeds are banned or where there are attempts to ban them. One example is the Hanzeboog, an attractive shorter link over a railway bridge which links Zwolle with villages to the south. Local politicians expressed concerns about safety and the local Fietsersbond have been campaigning against use of this bridge by mopeds. 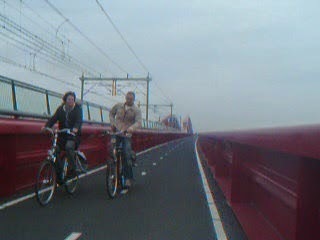 A local cyclist describes the fietssnelweg on the Zwolle side of the bridge as having just three faults: The beginning. The end. And the whole thing in-between. One of his main complaints is that there is a central ridge along much of the cycle-path (not over the bridge) which makes it difficult to overtake safely. This is not the sort of design feature which makes for efficient and safe cycling. The dangerous ridge is a deliberate design feature. A "blue line" of lights. Unfortunately, instead of there being a debate around whether the Hanzeboog and its associated cycle-paths are built to an adequate standard for a genuine fast cycling route, there's been a debate about who is allowed to use the substandard facility. I've not yet had a chance to read through the newly published "Inspiration book for fast cycle routes" but a review of this which I have read reports that it requires a design speed for future "fietssnelwegen" of only 30 km/h and uncomfortably small radius corners which suit this lower speed. That's not very "super" for a "cycle superhighway". Older cycle-paths without the fancy name were designed to higher standards. Not only is there no clear cut advantage to banning slow mopeds from cycle-paths in the cities but it seems that there is a distinct disadvantage to banning faster mopeds from cycle-paths in rural areas. Now you might think I've a vested interest, but I don't. Actually, I don't like mopeds. In fact, I have never liked them. I've also never worked for a company which sells them, have never owned one and never even wanted to own one. To me, mopeds get in the way, they make a lot of noise and they smell. However, this blog post isn't about whether I like mopeds. That I don't like them does not imply that I think they should be banned. A just society doesn't pass laws based on nothing more than likes or dislikes of individual or even of majorities. Laws should also not be passed based upon exaggerated claims. In order to ban something there needs to be a higher reason than a dislike. group, everything you do is "wrong". from people who "hate" racers. Another obvious out-group in the Netherlands is that of racing cyclists. In the last few years there have been headlines in the press about danger due to this group of cyclists (e.g. "Arrogant racing cyclists terrorising the cyclepaths", "Get the amateur racers off the cycle-paths"). I even found myself on a TV programme a few weeks back which was trying to make this case. There's also plenty of divisive language to be found elsewhere, even on the Fietsersbond website (e.g. a rather tiring and predictable thread about bells and slower cyclists being frightened by racers). In reality, just as there is no good statistical support for the idea that low power mopeds cause an inordinate danger to other cyclists in the Netherlands there is also no good support for the idea that racing cyclists do the same. In fact, it is estimated that even minor injuries caused by crashes between cyclists in the Netherlands occur on average at a rate of only once per 73 lifetimes per rider. Racing cyclists are involved in a small proportion of those crashes and by nature of how they ride their crashes are far more likely to be with each other than they are to be with strangers. A couple of years ago there were stories in the Dutch press about the problems caused by "bakfiets mothers" who were accused of blocking cycle-paths, riding on pavements (sidewalks) and going through red lights, amongst other things. There were also calls for reason. In some places there have also already been complaints about the speed of electric bikes. I also know from personal experience that people who ride recumbents can find themselves the subject of complaints. Here's an example: It happened was half way through a 100 km ride to visit a friend (i.e. bike loaded up, definitely not a race and I was not in any particular hurry). I was stationary behind the complainant as we had both stopped for a red traffic light. I had followed her for the last hundred metres or so at her speed and at a reasonable distance because we were both riding along the same narrow temporary cycle-path around roadworks to reach the same traffic light. She was unaware of me until we had both stopped and it was only on turning her head and spotting me that she complained that "recumbents are too fast" basing this only on the type of bicycle I was riding and not on my behaviour. It rather spoilt a pleasant day's cycling. This was rather reminiscent of the time when a pedestrian in the UK told me off at a pedestrian crossing because some other cyclist that he'd seen in the past had not stopped for him. That's "collective responsibility" in action. It makes no sense whatsoever, but out-groups are subject to it in this country as much as they are in any other country. Do I want to remain as a member of Fietsersbond ? I spent years in the UK as the subject of accusations of uncivil behaviour merely because I was a member of the minority out-group who use bicycles to get around and I spent some considerable effort trying to explain the reality (i.e. that cyclists are actually not a major health hazard). Moving to the Netherlands was a chance to leave behind this particular problem. I can ride my bike along the street here without anyone thinking it makes me odd. After arriving here I almost immediately became a member of the Fietsersbond (Cyclists' Union) who speak up on behalf of cyclists. I had hoped that they represented all cyclists equally but after what I've read over the last week or so I'm less sure now that they do. This organisation represents me because I am a member, but they're using exactly the same kind of language and exaggeration against a minority cycle-path user as I am all too familiar with being on the receiving end of when it was targeted against me as a cyclist in the UK. I'm ashamed by this and I don't want to be part of an on-line lynch mob. Real statistics and what cyclists really need. Regardless of all the scaremongering, cyclists are still safer in the Netherlands than they are in any other country. The real danger to cyclists in the Netherlands does not come from mopeds, racing cyclists or any other easy to identify sub-group of people who use cycle-paths. The most lethal sources of danger to cyclists in this country, just as elsewhere, are cars, trucks and buses. These much larger vehicles have potential speed, more kinetic energy and more weight so they kill both by impact and by crushing. A recent investigation shows that 60% of cyclist injuries, 5000 per year, are single sided collisions involving no other party. Bad maintenance still causes problems. i.e. fall at potholes or when there is ice. People also don't notice bollards and ride into kerbs. Those things can all be addressed (follow the links in the previous sentences) but they're still a significant danger. Riding when drunk is also significant. It reduces peoples' ability to make correct quick decisions. It's considered to be about as safe as walking when drunk and of course both are a better idea than driving. The main rise in injuries in recent years has been amongst retired people, who now cycle three times as much as they did in the 1980s. They ride at a higher speed and further than did before, in part due to their adoption of electrically assisted bicycles. Over 65s now make up 2/3rds of all cyclist fatalities in the Netherlands. Questions remain over the safety effects of ebikes on elderly people because these bikes increase their speed and that results in more serious injuries in the event of a crash. Older people are far more vulnerable when they crash. It is argued that perhaps their additional speed helps them to better match other bicycles so reduces conflict but I have to say that I'm skeptical of that idea. This is something I've covered before. Above all else, cyclists of all types need better infrastructure to improve their safety. This means not only better maintenance but also following the principles of sustainable safety to build cycle-paths wide enough to cope with the traffic which they carry without causing conflict and designed in such a way that they are self-explanatory in use. This attacks the cause of injury head-on. Mopeds shared cycle-paths in the Netherlands for decades now. There's nothing new about them. In the past they sold in greater numbers than they do now. The controversy over them is not new either. That's been going on for decades as well. I wrote this blog post in response to years of people making assertions to me that the number of injuries to cyclists due to mopeds was large, but none of the people making assertions and talking about anecdotes ever were able to back up their opinion with facts. I hoped that writing all this down would make people think, and perhaps also result in someone digging out an actual study which showed real danger from low power mopeds. Unfortunately, the response has simply been more assertions and more anecdotes both in the comments under this blog post and elsewhere where it has been discussed. There are no number of anecdotes that add up to make a fact. Cycling campaigners opposed to compulsory cycle helmets often use that line, and quite rightly so. But where mopeds are concerned, some of those same people turn around and claim that their anecdotes overrule the lack of evidence, even to the extent of wanting to use them to force moped riders to wear the helmets that they themselves avoid. This is not rational. If there was a real problem then there would be real evidence to support it. A biased Daily Mail article entitled "More than 11,000 cyclists caught running through red lights and riding on pavements in just one year" and the comments below the same echo exactly the same biased anti-out-group sentiment as seen in Dutch discussions of mopeds. The cause of conflict on cycle-paths has always been known: inadequate infrastructure, too narrow and designed for a lower capacity than is required. However, this doesn't stop people blaming other cycle-path users for the inconvenience that they feel and that has continued. If you're starting to blame people in scootmobiles for "chaos"
Disabled people gain enormous freedom from cycle-paths. 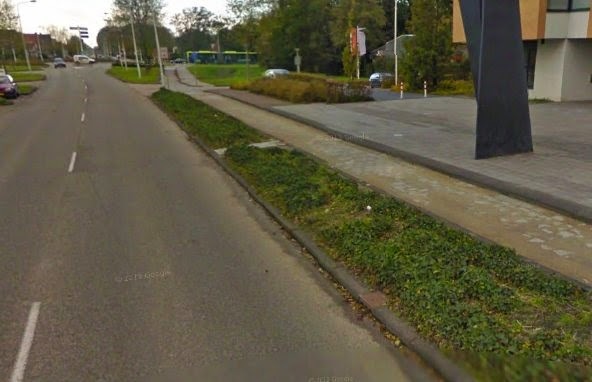 Two months after the blog post was originally published its come up again with complaints about "war" on the cycle-paths of Den Haag. Once again, people are blaming other cycle-path users for inconvenience even though it's been obvious for many years that Den Haag's infrastructure was nowhere near good enough. The twist this time is that not only are people railing against mopeds but they're also picking on bakfietsen used by parents to transport their children and scootmobiels. i.e. essential transport for disabled people. then this indicates that the infrastructure is not good enough. High levels of bakfiets usage are an indication of a problem. But it's not a problem due to the riders but a problem due to the infrastructure. Except for transporting goods and perhaps very small children, no-one should need a bakfiets. In Assen it's quite common to see pre-school age children cycling to the centre of the city because the infrastructure makes this possible. By the time that children are in primary school they should be able to ride their own bikes on school trips. All three types of safety are important to enable these things to happen. 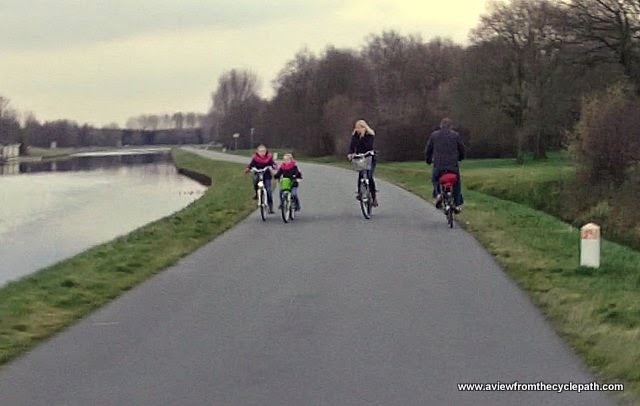 In some other Dutch cities and elsewhere in the world parents find the situation less safe and are more likely to use various different methods to ride with children on their own bikes. If you have "chaos" on cycle-paths, don't fight over the scraps and blame other cycle-path users who are simply trying to find their own safest way to get about, but get on with creating an environment which everyone can use in safety and without conflict. The Fietsersbond now appear to have declared war on any "fast" cyclists. They're participating in an experiment where a maximum 30 km/h speed limit is to be imposed on cycle-paths. Specifically they now talk about "cycle racers, recumbents, velomobile riders and fast e-bikes" being banned from a cycle-path as a trial starting from tomorrow. Instead of campaigning for better cycle-paths which can cope with varying speeds, Fietsersbond members in Franeker apparently want to ban people who they don't think are like themselves. This leaves Fietsersbond in a very strange position as they're actually arguing for lower speeds on cycle-paths than the design standards call for. It is recognized by CROW that speeds of "35-40 km/h" "are not at all uncommon", but Fietsersbond wants to restrict speeds to 30 km/h. They are in effect calling for a lowering of standards. a proper standard, not to have cyclists banned from using it. Everyone would benefit from this being improved. "Slow"
The stretch of cycle-path which Fietsersbond wants to eject "fast" cyclists from is actually really terrible. The correct response from a campaigning organisation should be to get this cycle-path improved, not to blame users for the danger that is created by the bad path. But in any case, what danger ? It seems that Fietsersbond have no figures to support the notion that there is danger here caused by cyclists and in any case there are no recorded incidents of any cyclists at all being involved in collisions or being injured between 2007 and 2012 in that location. Given that no-one has been hurt, how much safer can the situation be made to be by putting some of the cyclists into more danger ? In April I took part in a Dutch TV programme on which I pointed out that the danger to cyclists doesn't come from other cyclists. Clearly this point was lost somewhere. Finger pointing and accusation of danger has continued. Cycling declined sharply in the Netherlands before and it can decline sharply again if campaigners take their eyes off the ball. Rather than in-fighting between cyclists, the Netherlands needs all of them to pull together and ensure that the infrastructure continues to improve. If you want less cycling, then making cycling less useful is a good way of achieving that aim. Make cycling slower and less efficient, even suggest that lower design standards are good enough. If you can do all of this in the name of "safety" then that's even better. For someone who wanted to make cycling less popular, this stance might make some sense. But this is an absolutely ludicrous position for Fietsersbond to take. Note that the Fietsersbond webpage linked above was edited on the 27th of August. In particular, the text which stated clearly that this was an extension of the ban on snorfietsen was removed ("Voor deze proef wordt de BOR-wetgeving (Brommers op de Rijbaan) tijdelijk uitgebreid met hardfietsers!"). The trouble stirred up last year has now spread. 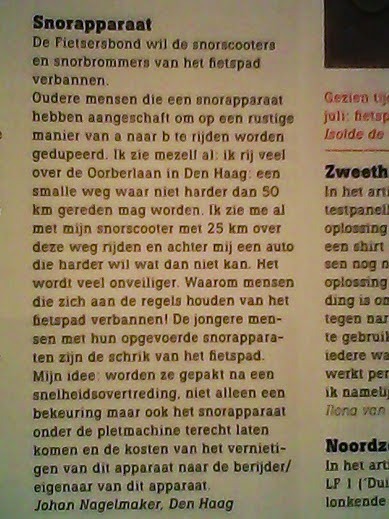 No lesser organisation than the Fietsberaad are now calling for a speed limit on cycle-paths to apply to all cyclists. 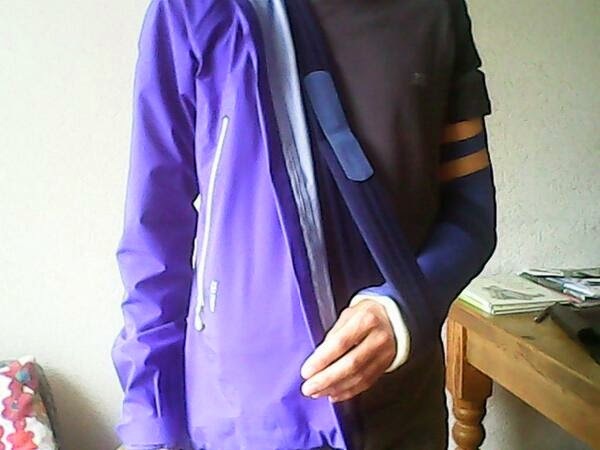 This is just about the most disastrous thing that could happen to cycling in this country. Any country which can build roads which are suitable for motor vehicles to travel on at 50, 80, even 130 km/h (the Netherlands recently increased the speed limit on motorways to 130 km/h) surely can also build cycle-paths which can cope with bicycles at speeds above 25 km/h. Not to do so is to doom cycling to become a less attractive mode of transport. People sometimes misunderstand why it is much more dangerous for a racing cyclist at 35 km/h to be passed by a car at 50 km/h (15 km/h speed difference) than it is a slower cyclist at 20 km/h to be passed by that same racing cyclist (also 15 km/h speed difference). The reason is that the amount of energy which would have to be dispersed in a collision is enormously different. Kinetic energy is calculated by the formula 1/2mv^2. The slow cyclist, assuming a total mass of 100 kg for bike+rider would have a kinetic energy of 20 KJ. A typical car (I'm using the gross weight figure for a Ford Focus) has a mass of 1880 kg. At 50 km/h, this has a total energy of 2.4 MJ. Two slow cyclists colliding with each other need to dissipate 40 KJ of energy. A racing cyclist has about 3x the energy of a slow cyclist. The total energy to be dissipated if a slow cyclist collides with a racer is 81 KJ, so about double what it would be if two slow cyclists collided. On the other hand, the car has vastly greater energy. This renders the contribution from the cyclist almost irrelevant. The total energy to be dissipated from a collision with a car is 2411 KJ in collision with the racing cyclist vs. 2370 KJ with the slow cyclist. It doesn't matter if a car collides with a fast cyclist or a slow cyclist. In either case, the car brings about 30 times as much energy to be dissipated in a collision as is the case in a collision between cyclists. Dissipation of this energy is what causes injuries and that explains why cars are so much more dangerous for cyclists than other cyclists. Higher car speeds rapidly increase the danger which they present (it's a square law) and buses or truck can easily present ten times as much danger as a car when travelling at the same speed simply because they weigh ten times as much. The real risk to cyclists comes not from other relatively slow moving and light weight cyclists but from motor vehicles. This blog post started with mopeds so it should perhaps also end with them as well. Mopeds weigh about twice as much as a bicycle and rider and therefore present about double the danger of a cyclist at the same speed. They're a very long way from being so lethal as a car. The NTFU continues to try to fight prejudice against racing cyclists by calling for all its members to behave perfectly. Unfortunately, these calls will not help. No out-group in history has ever managed to stop being treated as an out-group by conforming. Prejudice doesn't require a real problem with the behaviour of the group which is being singled out. 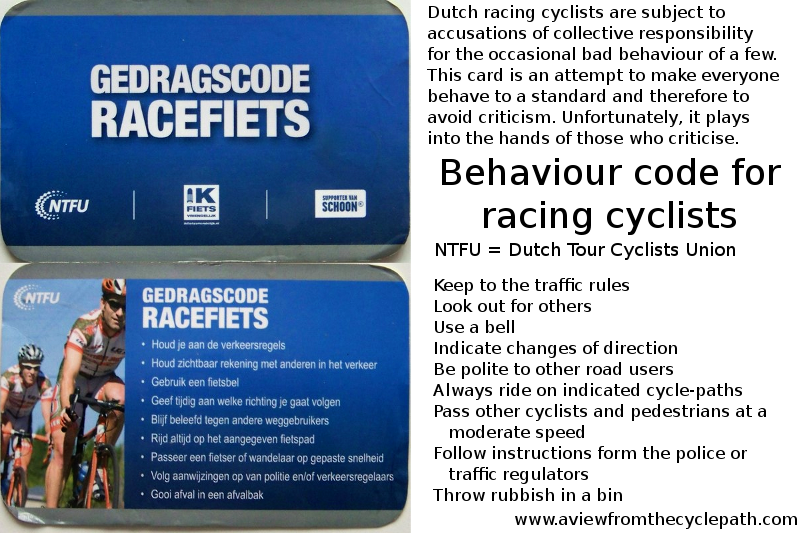 Racing cyclists now actually cause no problem at all in the Netherlands and by talking about themselves in this way, the NTFU runs the risk of confirming peoples' prejudices. The term availability heuristic refers to a "mental shortcut that relies on immediate examples that come to mind". This is what happens in the press and in society in general when discussing the danger of mopeds in the Netherlands just as it does when discussing cyclists in other countries. Wikipedia gives this example: "After seeing news stories about child abductions, people may judge that the likelihood of this event is greater. Media coverage can help fuel a person's example bias with widespread and extensive coverage of unusual events, such as homicide or airline accidents, and less coverage of more routine, less sensational events, such as common diseases or car accidents." All you need do is substitute "cyclists or moped riders" for "homicide or airline" and it results in a perfect explanation of why people imagine that danger on the streets comes from the less dangerous rather than the more dangerous participants. The diet ? We've been vegan (Dutch) for decades. We're healthy, so are our children. There are benefits not only for ourselves but also for the planet that we all live on and the animals which we share it with. However that's not what this blog post is about.